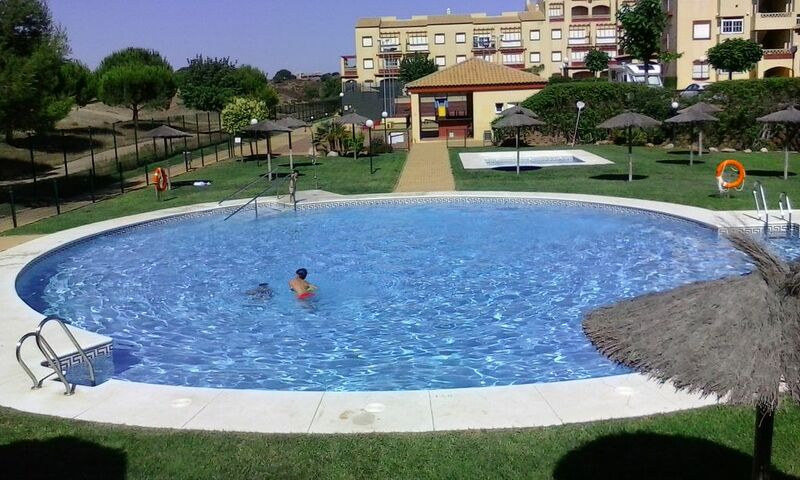 2 bedroom 2 bathroom garden apartment situated at Costa Esuri Ayamonte with views towards the bridge that links Spain and Portugal. The apartment benefits from being on the ground floor with easy access to the lovely landscaped gardens and close to the swimming pool. The apartment is well equipped and furnished to a high standard..
En suite to bedroom 1 with bath/shower over, WC, vanity basin. Bathroom with shower WC and wash basin. Cooker, hob, dishwasher, fridge/freezer, washing machine and microwave. The golf clubhouse, bar and restaurant are within walking distance there is a driving range and 2 x 18-hole courses. Outside: Patio table with 4 chairs, shared pool and gardens. The beaches are approx 15 mins drive away, two of the longest (2km) unspoilt beaches in Spain. Ayamonte is a old fishing port with white washed houses pleasant squares, baroque churches and a maze of narrow streets with many shops bars and restaurants. Ayamonte stands on the banks of the Guardiana River which looks towards the Portuguese town of Vila Real de San Antonio a ferry connects the 2 towns. The location is ideal for exploring Portugals algarve with its numerous golf courses, & the unspoilt beaches of the Costa de la Luz. Ayamonte is almost surrounded by water with the river on one side, with inlets & marshy land to the south which are populated by wetland birds. The historic city of Seville is just one hour away. For the children there is the theme park isla magical in Seville, also in Cartaya 25 mins away there is a go karting track and a water park. Only 10-15 mins drive away are the beaches of Isla Christina & Isla Canela with golden sands & are perfect for swimming. Portugal is only a short drive away across the suspension bridge that links Spain and Portugal. Booking Notes: Your booking can be secured by a £100 deposit the full balance payable 6 weeks before departure + £150 damage deposit also payable with final payment. Changeover Day: Flexible. Notes on prices: Prices are for the property per week in UK Pounds. Last minute bookings accepted but have to be paid in full before departure. You can pay by cheque,cash and debit/credit card visa mastercard etc. If you wish a midweek or weekly clean there is a extra cost of 50 euros payable locally. There is also small charge for laundry £7 PPPW.